The savings were identified by Mastodon C, a big data start-up company based at the ODI; Open Health Care UK, the health technology start-up behind the NHS Hack Days; and Ben Goldacre, the doctor and writer behind BadScience.net. 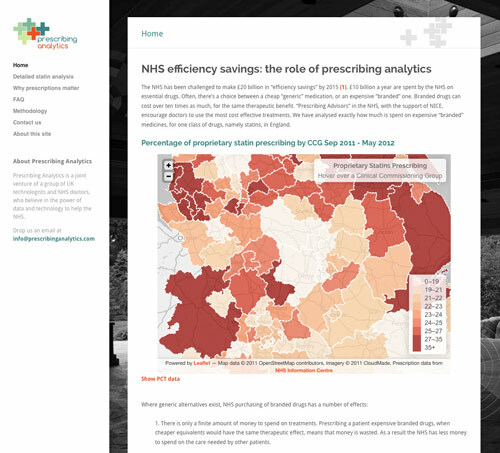 In just 8 weeks, working with publicly available NHS prescriptions data, the team looked at the prescribing patterns in GP practices, CCGs, and PCTs. They focused on a class of drugs called statins, which are used to prevent cardiovascular problems. The current evidence shows that for most patients, all drugs from this class are equally safe and effective, so doctors are usually advised to use the cheapest. The analysis examined how much money was spent in each area on the more expensive drugs. It looks at the entire prescriptions dataset (37 million rows of data), and therefore represents results from facts, not models. If the research had been conducted a year ago, over £200m could have been saved, looking forward the team expect to identify similar potential savings. An average £27m a month of potentially unnecessary expenditure on the two proprietary statins took place last year in the NHS in England. This is part of a wider issue of spending on proprietary drugs in cases where good and far cheaper generic equivalents exist. Previous research has estimated that these wider patterns cost the NHS over £1 billion pounds a year in excess spend*. The cost of an individual prescription item can vary from as little as 81p for a generic, to over £20 for drugs still under licence to the pharmaceutical companies that develop- The set of available drugs is constantly evolving, and the right prescription for each individual is very personal. The analysis doesn’t suggest that all the prescribing costs identifiedare “waste” but a clear public overview of the data can make it easier for doctors, patients, politicians, the NHS and the public to identify potential savings.The initial data analysis is available through a new online portal called Prescribing Analytics, which is open to everyone – but particularly to support health care professionals and managers with responsibility for prescribing drugs and controlling budgets. “This project is an example of how open data can be used to help services run more effectively and efficiently. In using open data to highlight trends, we see where we can do better and make improvements. Inefficiency in any system often results from poor or incomplete information about the overall picture. This is something that open data can address as Prescribing Analytics so dramatically illustrates. The analysis should be required reading for all GPs as they seek to make best use of their resources”. One of the drugs in this first phase of work, Atorvastatin, has now come off licence. However, the team working on Prescribing Analytics have identified several more drug categories that they plan to analyse. “This is an exceptional example of Open Data being transformed into knowledge for everyone. It gives patients and GPs the tools they need to help realise big savings for the NHS – which is ultimately value for everyone.